For those of you who have heard of the whole Green Monster Movement, this post will be nothing new to you. For those of you who think I'm talking about something related to Fenway Park, then listen up. There are like umpteen-million combinations for this drink. But the basic idea is you blend up some spinach with milk, some fruit and ice. Now I know what most of you are thinking..."Spinach?!? In a smoothie?!?" But hear me out. I promise, promise, promise you cannot taste the spinach. Once you blend it together with the milk and fruit, the only thing you taste is whatever other ingredients you chose to make your smoothie. The result? 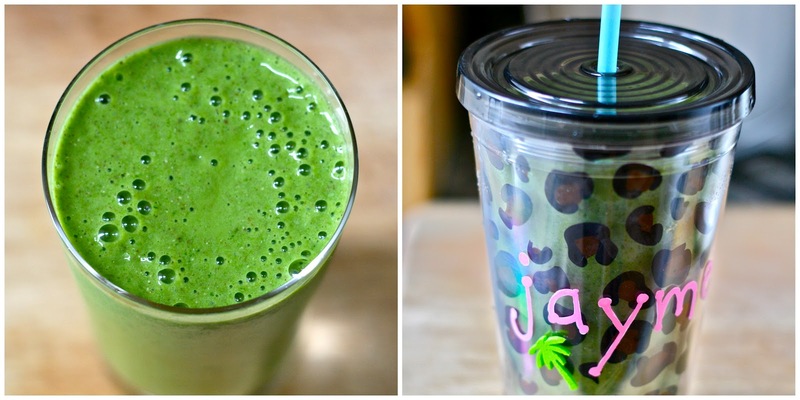 You get all the nutrients of 1-2 cups of spinach in a sippable drink. PLUS, you will find yourself with more energy, healthier skin & hair, and a decrease for your desserts cravings. Like I said, the possibilities are endless as far as combinations go. However, I like to keep mine pretty simple. I like to have something that's high in protein and antioxidants and lower in carbs. I like to add one teaspoon of chia seeds (considered a superfood), one scoop of this women's protein powder I get from Trader Joe's (as opposed to the two in a serving), and 3/4 cup of almond milk. (I usually buy plain almond milk, but I accidentally grabbed the vanilla one last time I was at the store...very good, but I think regular works just fine and is less calories). I find the easiest way is to first add the chia seeds and powder (to avoid them flying all over the blender), then the almond milk on top, then 1-2 cups of spinach (I just grab a couple of handfuls). Blend this up. Then add a peeled *banana and blend. Finally, add some ice and blend until smooth. (*I personally think no matter what other fruit you add, that a banana is essential to making a perfect smoothie. However, if you hate bananas, feel free to experiment with other fruits). Also, as one reader commented below, if you freeze your bananas first, you won't need to use ice, and will get more of a "milkshake" consistency! Awesome. And that's it!! The result is a healthy, low-calorie (around 200), protein-packed (12 grams) drink that you can take on the go. Do you like green monsters? If so, share your recipe in the comments section below. And for more great recipes, check out the Green Monster Movement website. Add seeds and powder to bottom of blender. Pour in milk and add spinach. Blend until smooth. Add banana and blend. Lastly, add ice and blend until desired consistency. Enjoy immediately! Never heard of such a "movement" before....Just tried your recipe except with fat-free milk and chocolate protein powder and no chia seeds...I was skeptical...I thought I would hate it...But it tastes REALLY GOOD!...Thanks for introducing this into my life Jaymee! Right?!? So good. Glad you liked it! I like the taste of green drinks, if you have ever tried a shot wheat grass juice, you know exactly what I’m talking about! On the other hand, there are few people like me, who like the taste of green drinks.